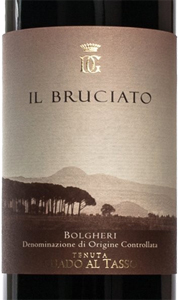 The Bolgheri DOC 'Il Bruciato', Tenuta Guado al Tasso, by Antinori is the younger brother of the Guado al Tasso, characterized by a modern and harmonious. It comes from the vineyards of the plant management is still focused on maximizing quality. Matured for at least 8 months in oak barrels and 4 months in the bottle: the result is a wine of great intensity and softness. THE WINE The Bolgheri DOC Il Bruciato , Tenuta Guado al Tasso , of Antinori is the younger brother of the "Guado al Tasso", characterized by a modern and harmonious. It comes from the vineyards of the plant management is still focused on maximizing quality. Matured for at least 8 months in oak barrels and 4 months in the bottle: the result is a wine of great intensity and softness. An intense ruby red in color, the wine shows attractive and complex aromas of red berry fruit, sweet spices, and toasted coffee. The flavors are full, round, and of high level balance and pleasure. It will be a vintage well capable of improving over time. The 2015 vintage was characterized by abundant rainfall during the winter and by a dry and mild spring. The bud burst, notably earlier than in 2014, was followed by an equally precocious flowering. The first part of summer saw an important rise in temperatures, which came back into balance during the second half of the month of August, assisting the grapes to achieve a perfect state of ripeness. The harvest began in early September and lasted all the way through the first ten days of October. The grapes which were selected came from a range of vineyard plots which extend over some 200 acres (80 hectares) and express the typical characteristics of the Bolgheri production zone. The fermentation took place in temperature-controlled stainless steel tanks and lasted from 10 to 15 days at temperatures between 82° and 86° Fahrenheit (28°-30° centigrade). A part of the Merlot and Syrah must was fermented at lower temperatures to better conserve varietal aromas. The malolactic fermentation took place partly in oak barrels and partly in stainless steel tanks and terminated for all the different grape varieties by the end of the year. The wine was then racked and went back into small oak barrels for a seven month aging period, at the end of which it was bottled. Four months of bottle aging preceded commercial release. Guado al Tasso Estate is located near Bolgheri on the Tuscan coast, 96 kilometers (60 miles) to the southwest of Florence. The 300 hectares (750 acres) planted to vineyards on the property are in the center of the so-called” Bolgheri amphitheater”: rolling hillsides which surround a splendid plain which slopes gently towards the sea and create a micro-climate with unique characteristics. Guado al Tasso, the flagship wine of the estate, expresses all of the force and suppleness of this corner of the upper Maremma. It has contributed to raise Bolgheri to the level of the most important areas of Europe’s viticulture, expressing a decisively Mediterranean character of power, elegance, and balance. Bolgheri , prestigious, small DOC where sitrova Guado al Tasso, is famous for rosé up from the 70s: for them and for whites, in 1984 received the recognition of the Denomination of Origin, then extended to the red in 1994 . The area is now best known and respected. The seal area is more than 1,000 hectares of which 300 are planted with vines; There is also a forest, the Burnt Macchia, where they raised in the wildness of Cinta Senese pigs and other animals. The vineyards - at 45-60 meters high above sea level, on soils of varying composition - are planted with Vermentino, Cabernet Sauvignon, Merlot and Petit Verdot, with small amounts of other varieties. Thanks to the mild climate to the nearby presence the sea and the constant breezes that mitigate the summer heat and winter cold and clean the sky and hold high the insolation index, here the harvest is done usually in late August, two weeks earlier than in the inland areas of Tuscany . An ideal climate for the small nursery where they grow the "cuttings", young plants of different varieties for other estates of the Antinori in Tuscany and Umbria. THE COMPANY The Antinori family has been making wine for over six hundred years when, in 1385, Giovanni di Piero Antinori became part dell 'Arte Fiorentina dei Vinattieri. Throughout its long history, spanning 26 generations, the family has always personally managed the business making innovative, sometimes courageous choices, always with unwavering respect for tradition and for the territory. Today the company is headed by Albiera Antinori, with the support of the two sisters Allegra and Alessia, personally involved in the business activities. Marchese Piero Antinori is currently the Honorary President of the company. Tradition, passion and instinct have been the driving qualities that have led Marchesi Antinori to establish itself as one of the leading Italian wine producers. Every vintage, every terroir, every idea you want to put in place is a new beginning, a new quest to raise our quality margins. As Marchese Piero loves to repeat: "ancient roots play an important role in our philosophy, but they have never held back our innovative spirit." The estates of Tuscany and Umbria, historical heritage of the family, have been added with the time investment in other areas suitable for the production of quality wines both in Italy and abroad, where they could embark on a new path of exploitation of new " terroir "high production potential. Marchesi Antinori expresses his passion for winemaking looking for improvement increasingly thin. Why increases in continuous experiments in the vineyards and cellars with selections of native and international clones of grapes, types of crops, vineyard altitudes, fermentation methods and temperatures, traditional and modern vinification techniques, different types of timber size and age of barrels , and varying the length of refining in the bottle. "We have shown over the years that in Tuscany and Umbria it was possible to produce quality wines, recognized internationally, they could show elegance and refinement while maintaining the character originario.La Our library has many titles, but for us is not rich enough. We have a mission that is not fully accomplished, which pushes us to express the vast potential of our vineyards and reconcile again remains to be discovered with the heritage of the Tuscan taste that includes traditional, culture, agriculture, 'artistic and literary These things represent the identity of the Marchesi Antinori, one of the greatest strengths lies in the fact of being Tuscan, or if you prefer, our' Tuscan '. " Piero Antinori The Antinori family is part, since its foundation, the PFV, "Premum Familiae Vini", an informal association of wineries owned by a family. PFV goes beyond geographical borders and keeps a common bond: that of the vineyards properties and the production of wine as a family business to grow and improve, like a fine wine, over time. Before 27,00 € tax incl. Tasting Color - ruby red Scent - has notes of cherry in alcohol, tobacco, candied orange and spices Taste - vibrant, soft and persistent with a spicy aftertaste. 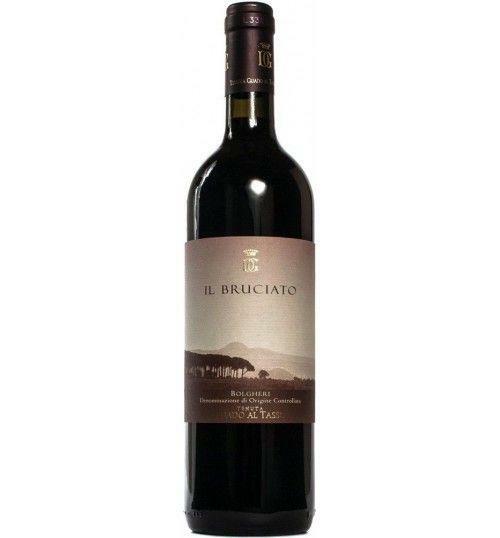 The Bolgheri DOC Il Bruciato, Tenuta Guado al Tasso, of Antinori is the younger brother of the "Guado al Tasso", characterized by a modern and harmonious. It comes from the vineyards of the plant management is still focused on maximizing quality. Matured for at least 8 months in oak barrels and 4 months in the bottle: the result is a wine of great intensity and softness. The 2015 vintage was characterized by abundant rainfall during the winter and by a dry and mild spring. The bud burst, notably earlier than in 2014, was followed by an equally precocious flowering. The first part of summer saw an important rise in temperatures, which came back into balance during the second half of the month of August, assisting the grapes to achieve a perfect state of ripeness. The harvest began in early September and lasted all the way through the first ten days of October. The grapes which were selected came from a range of vineyard plots which extend over some 200 acres (80 hectares) and express the typical characteristics of the Bolgheri production zone. The fermentation took place in temperature-controlled stainless steel tanks and lasted from 10 to 15 days at temperatures between 82° and 86° Fahrenheit (28°-30° centigrade). 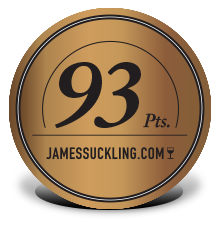 A part of the Merlot and Syrah must was fermented at lower temperatures to better conserve varietal aromas. The malolactic fermentation took place partly in oak barrels and partly in stainless steel tanks and terminated for all the different grape varieties by the end of the year. The wine was then racked and went back into small oak barrels for a seven month aging period, at the end of which it was bottled. Four months of bottle aging preceded commercial release. Guado al Tasso Estate is located near Bolgheri on the Tuscan coast, 96 kilometers (60 miles) to the southwest of Florence. The 300 hectares (750 acres) planted to vineyards on the property are in the center of the so-called” Bolgheri amphitheater”: rolling hillsides which surround a splendid plain which slopes gently towards the sea and create a micro-climate with unique characteristics. Guado al Tasso, the flagship wine of the estate, expresses all of the force and suppleness of this corner of the upper Maremma. It has contributed to raise Bolgheri to the level of the most important areas of Europe’s viticulture, expressing a decisively Mediterranean character of power, elegance, and balance. Bolgheri, prestigious, small DOC where sitrova Guado al Tasso, is famous for rosé up from the 70s: for them and for whites, in 1984 received the recognition of the Denomination of Origin, then extended to the red in 1994 . The area is now best known and respected. The seal area is more than 1,000 hectares of which 300 are planted with vines; There is also a forest, the Burnt Macchia, where they raised in the wildness of Cinta Senese pigs and other animals. The vineyards - at 45-60 meters high above sea level, on soils of varying composition - are planted with Vermentino, Cabernet Sauvignon, Merlot and Petit Verdot, with small amounts of other varieties. the sea and the constant breezes that mitigate the summer heat and winter cold and clean the sky and hold high the insolation index, here the harvest is done usually in late August, two weeks earlier than in the inland areas of Tuscany . An ideal climate for the small nursery where they grow the "cuttings", young plants of different varieties for other estates of the Antinori in Tuscany and Umbria.